Neurons, or nerve cells, are the basic functional units of the nervous system. Students use the Virtual Neurons software to construct neural circuits and visualize how messages travel through the circuits. As an extension, students can design and implement an experiment manipulating circuit components to alter neural communication. Click the image above to play the game in your browser. Problems? Visit our help page for ways to get the program running on your device. While you use the software, once you've set up a circuit, click on the "Zoom in..." button at the left. You'll see blue circles over the axon end of the neuron and gold circles over the dendrites. If you click on the area where the two circles overlap, you'll see a pop-up animation of the synapse. Click on Learn! to get more information. 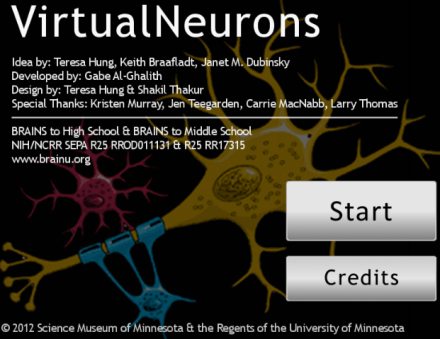 Virtual Neurons has been accepted into the Life Science Teaching Resource Community Archive of Teacher Resources. Model how interacting systems provide specific functions within multicellular organisms.